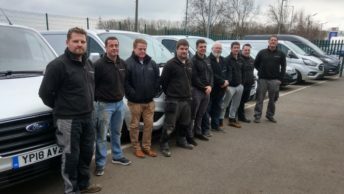 An expanding veterinary practice in Norfolk is benefitting from heating and hot water at reduced energy bills, thanks to a ground source heat pump installed by the renewable heating experts Finn Geotherm. Hannah Kelly, owner of Wood Farm Vets, started the practice in 2014 to care for large and small animals. 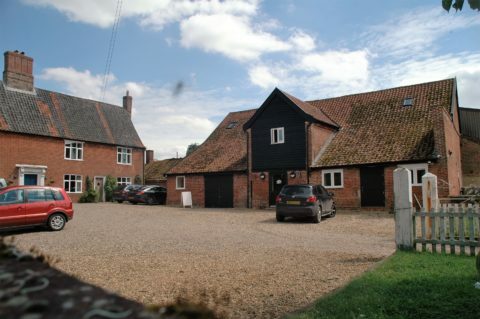 Initially, Hannah ran the practice from her home, a farmhouse in Wymondham, South Norfolk, but rapidly outgrew the premises. Hannah began to renovate a grade two listed former corn barn on her land to create a modern mixed practice, capable of treating all manner of animals from horses to hamsters on-site. As part of the renovation, Hannah needed a heating and hot water system that would be able to cope with the demands of her busy business, as well as also servicing her house, which had previously relied on an oil boiler. Wood Farm Vets wanted a sustainable and future-proof solution so ground source heating was ideal. With a generous amount of land available for a 1700m collector loop, Finn Geotherm specified and installed two Lampoassa Esi 14 ground source heat pumps with a 1000litre Superheat thermal store. A former outhouse, complete with built-in bread oven, was transformed into the plant house for the pumps and thermal store. 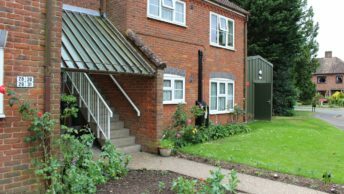 The vets had both underfloor heating and radiators installed to work with the new heat pump, while Hannah’s house used its existing radiators. 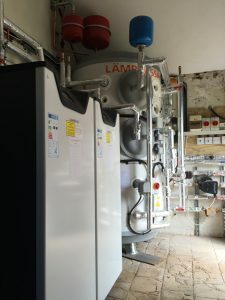 While the single phase electricity in the premises initially presented Finn Geotherm with a bit of a challenge, the careful specification of a system with two heat pumps working in tandem achieves outputs of around 30kW, which is way above other similar systems. The installation at Wood Farm Vets and Hannah’s home will also benefit from the government’s Renewable Heat Incentive (RHI), a government financial incentive which rewards people and businesses for opting for renewable energy.